“That’s beautiful!” enthused my then 3 year old son, looking at the machinery under our car’s bonnet. M was checking the oil level and J just happened to be there. J is nearly seven and is just as fascinated by cars now as he was four years ago. He is morphing into a somewhat capable backseat driver, much to the chagrin of his parents. You can imagine his delight when I told him about Young Driver – a system of driving lessons for 10 to 17 year olds. Now J is not old enough or tall enough to qualify for these, but Young Driver also offer car driving sessions for 5 to 10 year olds where children get to drive what are called ‘Firefly’ cars. 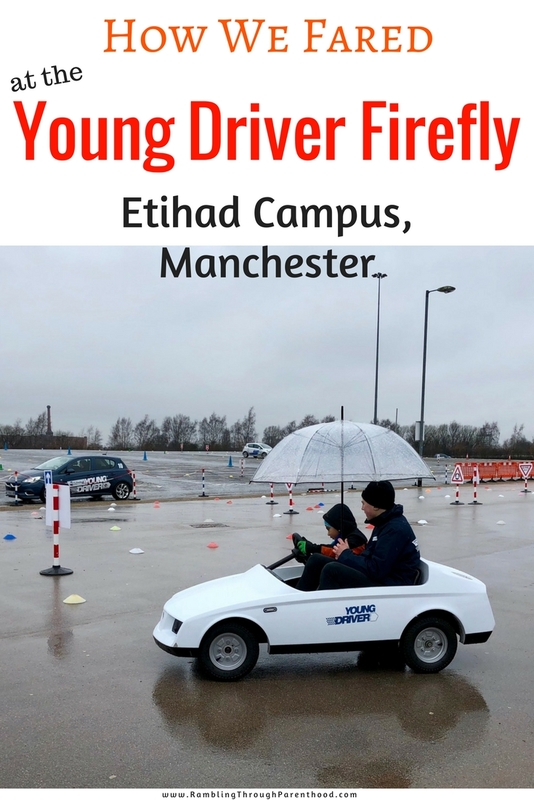 Firefly are two-seater cars specially styled for Young Driver. 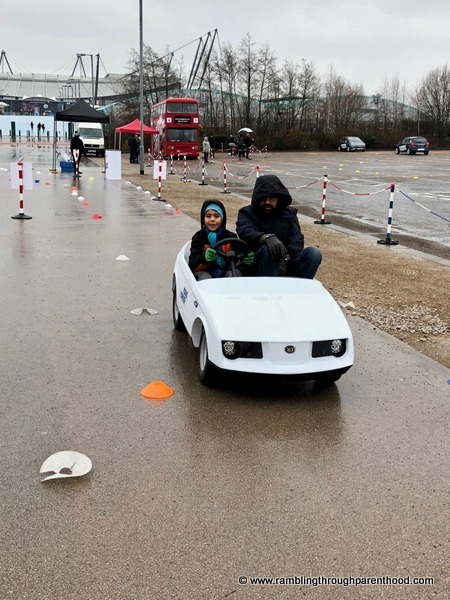 The adjustable passenger seat means a parent or carer can accompany their young driver on the track and issue directions, guidance or operate the emergency cut off switch if the need arises. Firefly lessons are available at 9 sites across the country and start at £19.95 for a 20 minute session. We were booked in at The Etihad Campus in Manchester for our lesson. It was a damp, grey day as we made our way on Manchester’s Metrolink to the Etihad Campus. 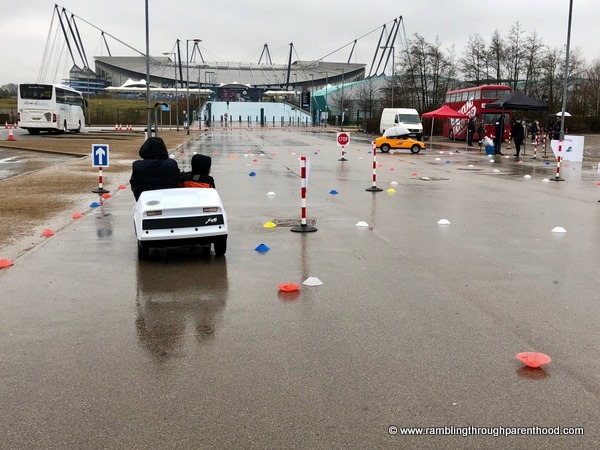 The driving area is situated over the bridge from the Manchester City football stadium and is a couple of minutes walk from the tram station. Once there, we were shown to the office - a disused red double-decker bus, which also serves as a holding area for the older children. We had to sign a form to say J was medically fit to undertake the lesson and that we were responsible for him at all times on the track. We then made our way to a little marquee where a couple of members of staff were on hand to take us through our Young Driver experience. J was shown to a white Firefly car. 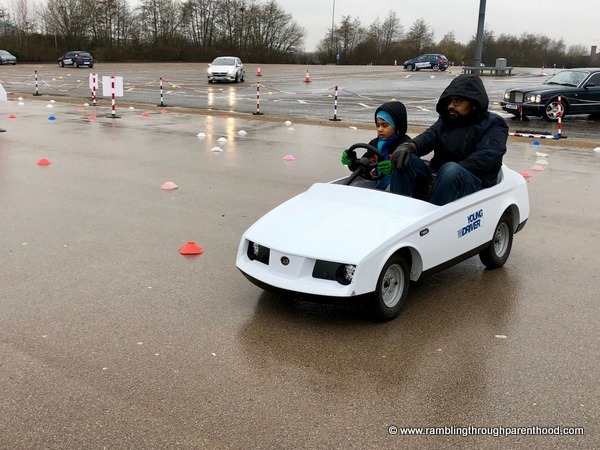 The instructor showed him how to operate the car with his right foot on a pedal. He had to press down on the pedal to accelerate and ease off it to slow the car down, steering simultaneously. He took him around the course a couple of times, getting him to steer left and right around bends and reverse back. Next it was M’s turn to get into the passenger seat. He was told how to reverse the car by flipping a switch and how to stop it by turning off the main key. J was in his element, driving the Firefly around the course. The track was lined by cones on either side. The challenge was to steer clear of the cones and drive in the middle. J did rather well, running over a couple of cones at the beginning, but then skilfully manoeuvring around them. As J grew in confidence, M got him to go round a mini roundabout laid out in the centre of the track. They took right and left corners and had a go reversing the car out of a dead end in the track. J was beaming by the time he had finished his lesson. The grin grew wider when he was given a little plastic driving license at the end, which looked very like the real thing. 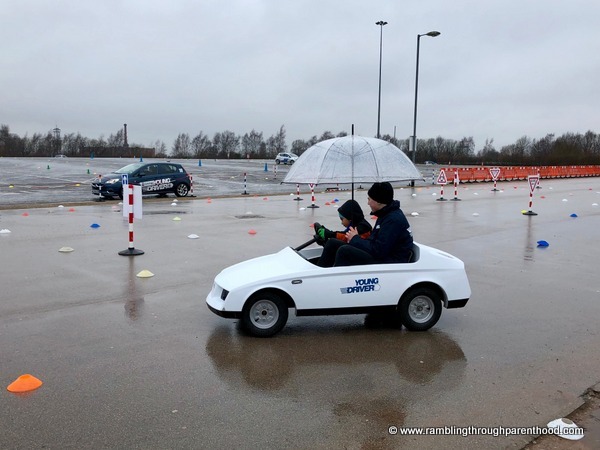 It continued to rain incessantly throughout our 20 minute Young Driver session. I huddled under an umbrella and managed to take a few photos, but by the time J had finished, all we wanted was to go indoors and get warm. I would have loved to, but did not get the chance to explore the Firefly and its features. I am told it handles like a real car, with headlights, indicator lights and a dashboard with electronic speedometer, clock and power status dial. To be honest, J would have loved to have a go at these as well, seen as he is forever asking questions about how everything works in my car. I am guessing the instructor did not want to overwhelm J as it was his first lesson, allowing him to focus on the steering. I would like to think they introduce children to these additional features in subsequent lessons. 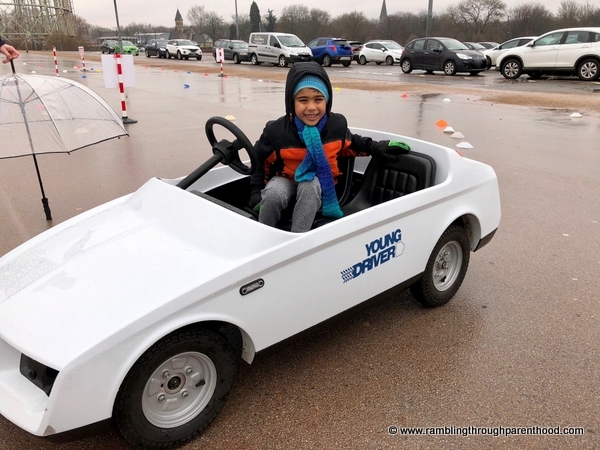 My son enjoyed his Young Driver experience and there has been talk of going back for another lesson. We shall see. Disclosure: We were offered a free Firefly lesson in exchange for this review. All opinions are my own. This sounds like so much fun! I would've loved to try something like this when I was a kid. Me too! I guess learning to drive would have become much simpler. That's great, I didn't know you could get driving tuition so young. Hopefully one day he will be driving you around for real!